In 2013 HTC was firmly established as a leading maker of Android smartphones. At the same time, Facebook was experience a huge surge in popularity, signing up its billionth user a few months previously. Creating a product that combined a good quality Android handset with an unrivalled social networking experience should have been a huge success, but instead it ended up as a huge disaster. The device in question was the HTC First, a decent and inexpensive midrange handset with an excellent 4.3” display and a rather pleasing minimalist design (or you might just call it “boring”). The software that made it different from other Androids was Facebook Home which replaced pretty much the entire Android experience with Facebook instead. Facebook Home’s lock screen displayed notifications from the owner’s Facebook feed, and opening the phone would lead to an advanced Facebook app rather than Android. More immersive than the standard Facebook app, Home included features such as “Chat Heads” which meant that you could talk to a friend while using another app. There were a few disadvantages – one of which was that Home relegated the usual Android interface and apps to a back burner. The HTC First also suffered from a poor camera and limited non-expandable internal memory. But overall the package looked like it would appeal to those consumers who were glued to Facebook all the time. More to the point, HTC had previously had a minor success with a couple of other Facebook-y phones, so it wasn’t a complete shot in the dark. 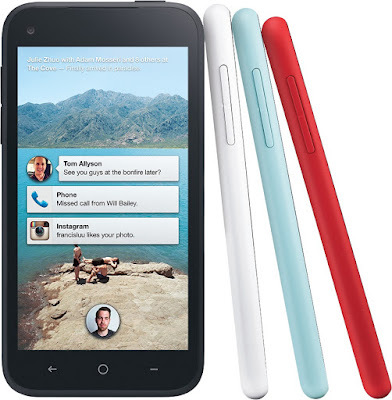 The HTC First and Facebook Home launched amid much publicity in April 2013. The plan was that AT&T in the US would get the device first, followed by selected other carriers worldwide. AT&T offered the first at $99.99 with a two-year contract, which was pretty decent value. Everybody seemed to be expecting the First to sell well. It didn’t. AT&T found that the handset wasn’t shifting, so they dropped the price to 99 cents after a few weeks. But then it still didn’t shift, and after selling reportedly less than 15,000 units despite the price drop it was dropped by AT&T. Despite Facebook and HTC claiming that the worldwide rollout was “delayed”, the device was cancelled amid much blood-letting and both HTC and Facebook. In short, the HTC First and Facebook Home were a disaster. What seemed like a good idea at the time just didn’t appeal to consumers, who even five years ago were worried about the privacy implications of a device running Facebook all the time. Even for die-hard Facebook fans the interface was just too much Facebook, too much of the time. The First lasted for about a month, Facebook Home limped on until January 2014 when Facebook stopped updating it. In the long run the fiasco didn’t do Facebook a lot of harm, but it didn’t provide the turnaround in fortunes that HTC needed and in 2018 HTC divested part of its smartphone business to Google – but ask Motorola how Google’s previous adventure in that field turned out. You might guess that we're not monster fans of Facebook by the following product tour we made at the HTC First's launch.